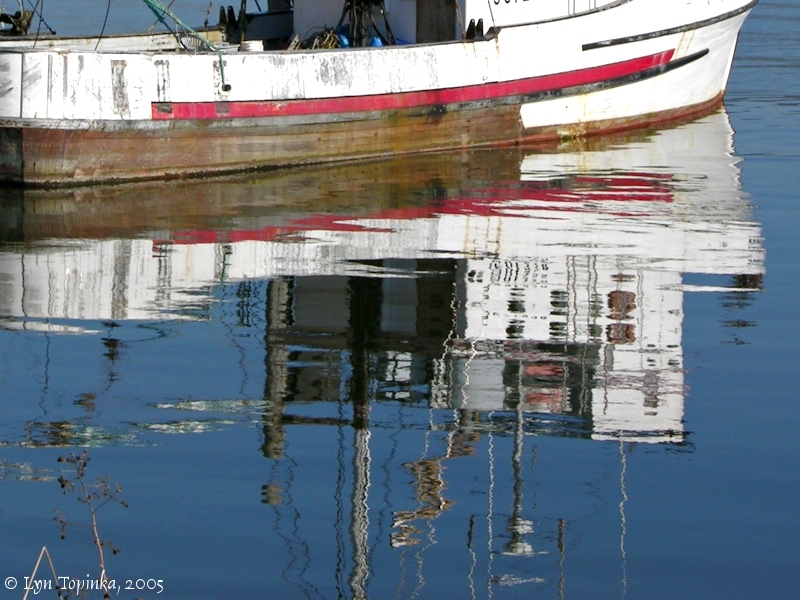 Click image to enlarge Goble, Oregon, boat dock. Image taken February 19, 2005. 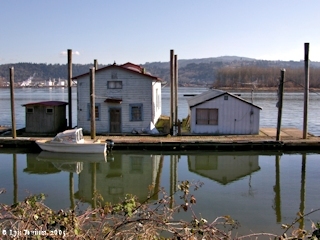 Goble, Oregon, is located along the Columbia River at River Mile (RM) 74, and is situated just slightly downstream of Sandy Island, and across from Kalama, Washington. Downstream on the Oregon side is Prescott Beach, Coffin Rock, and the Trojan Nuclear Facility. Upstream is Deer Island and the now-forgotten community of Hunters. Goble was named after an early homesteader, Daniel Goble. Lewis and Clark spent the night of March 27, 1806, near the location of Goble. 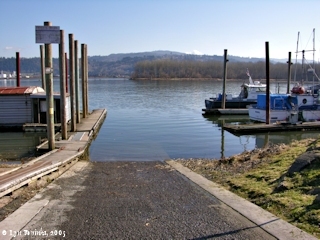 Click image to enlarge Goble Landing boat dock, Goble, Oregon. Image taken February 19, 2005. 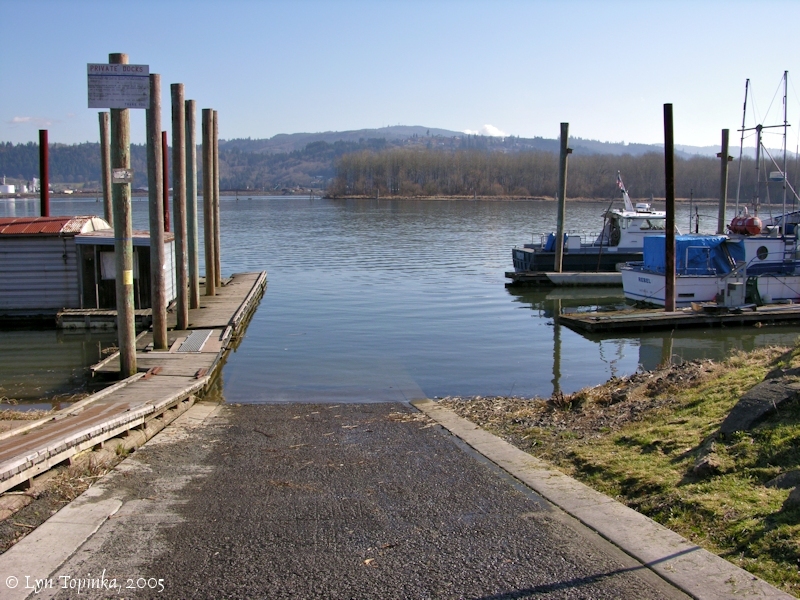 Lewis and Clark spent the night of March 27, 1806, near today's Goble, Oregon, a little across and upstream of the mouth of the Kalama River, Washington. 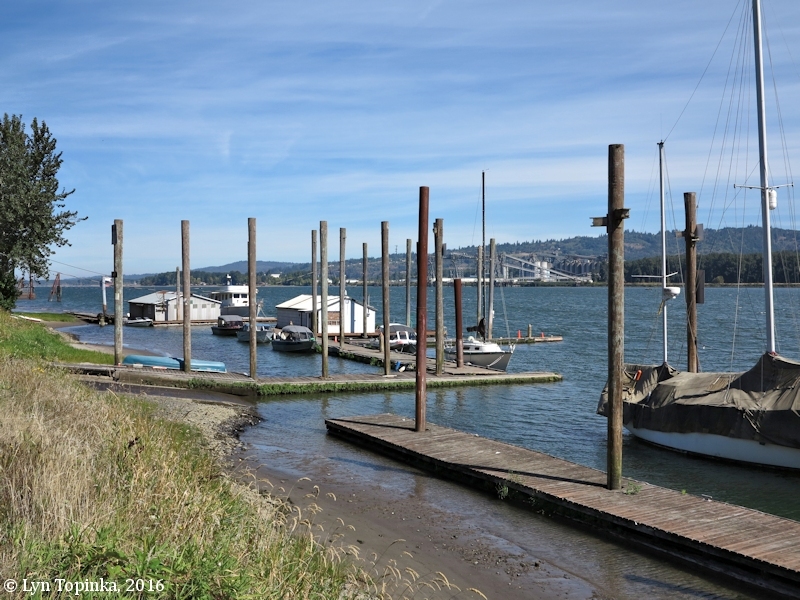 Lewis and Clark's previous campsite was on Walker Island, and their campsite of March 28, 1806 was on Deer Island. 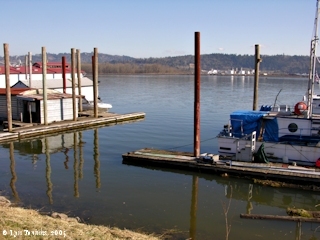 Click image to enlarge Downstream tip of Sandy Island, as seen from Goble Landing docks, Oregon. Image taken February 19, 2005. 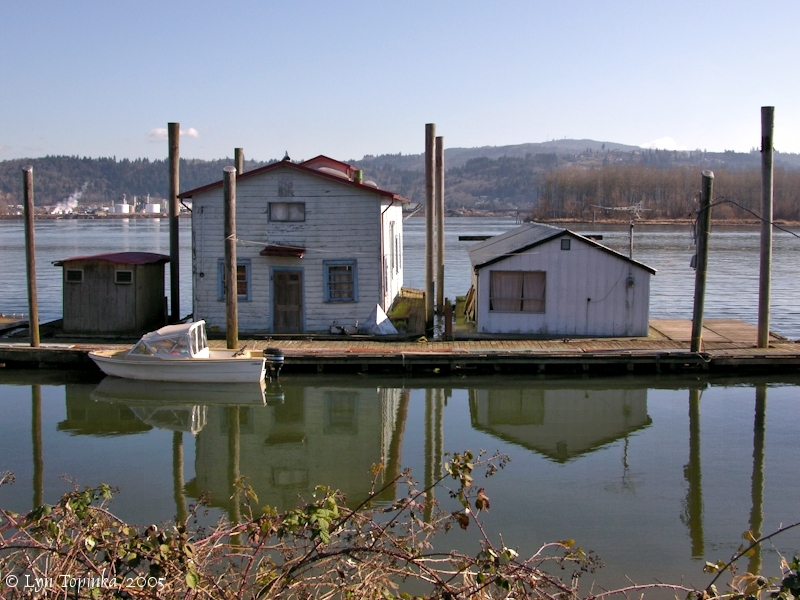 Click image to enlarge Dock houses, Goble Landing, Goble, Oregon. Image taken February 19, 2005. 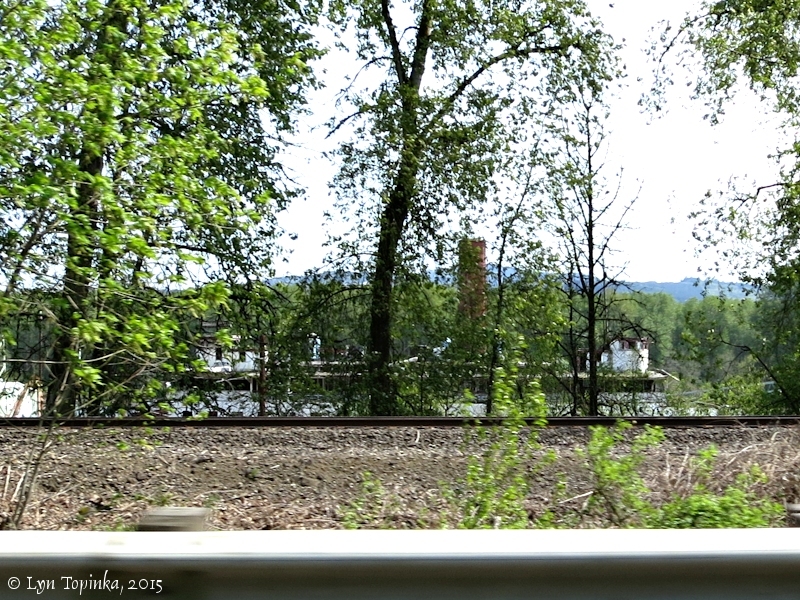 Click image to enlarge From Goble, Oregon, towards Kalama, Washington. Image taken February 19, 2005. 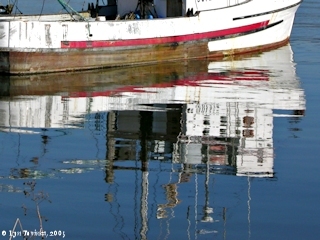 Click image to enlarge Reflection, Goble, Oregon, boat dock. Image taken February 19, 2005. In 1853 Daniel Goble took up a donation land claim on the Oregon side of the Columbia River. The U.S. Bureau of Land Management, General Land Office Records, shows a Daniel B. Goble being issued a land title on October 15, 1873, for 172.4 acres for parts of T6N R2W Section 12, under the 1850 "Oregon-Donation Act". The 1856 cadastral survey (tax survey) for T6N R2W, filed at the Surveyor's Office of Oregon, has the "Gobal" homestead labeled. Upstream off the Oregon shore is "Coffin Rock" and downstream towards the middle of the Columbia River is "Sandy Isd.". The 1888 nautical chart "Columbia River, Sheet No.4, Grim's Island to Kalama", has Sandy Island labeled as "Sandy I. 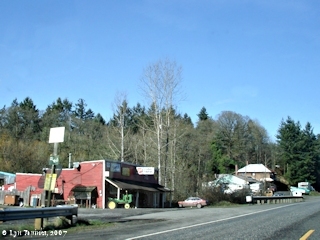 ", and shows it directly across from the Washington town of "Kalama". 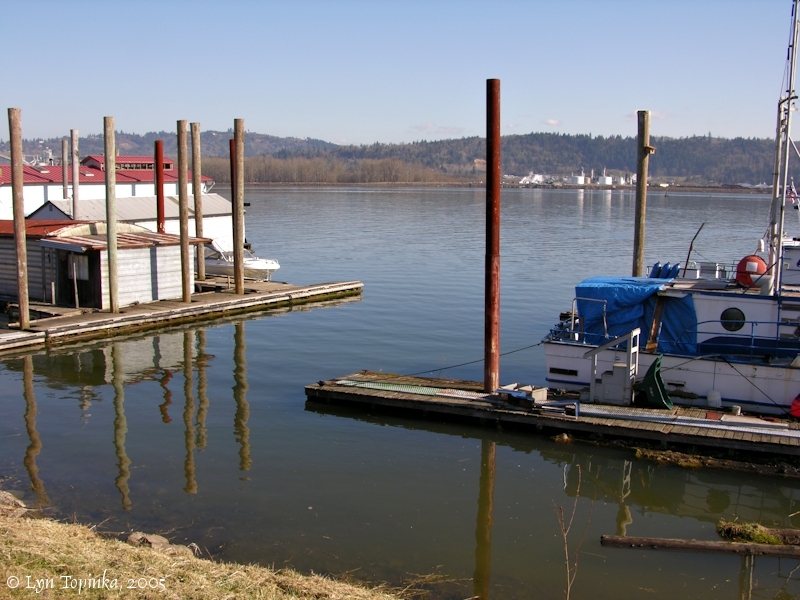 Just downstream on the Oregon side is "Gobles Pt.". Eventually Daniel Goble sold his land to George Foster, who laid out a town and named it Goble. The Goble Post Office operated between 1894 and 1960. "... 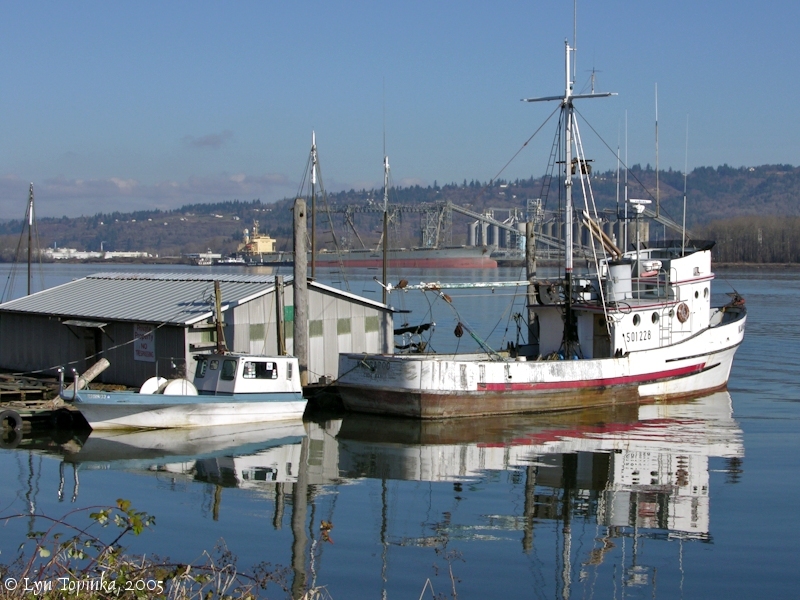 Between Astoria and Portland there are numerous landings and settlements, dependent either on the fisheries or acting in some cases as shipping points for the country immediately behind them; these are ports of call for the regular river steamers. 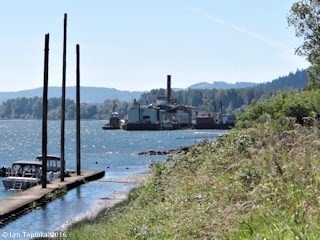 Deep-draft vessels do not as a rule stop between Astoria and Portland, except for lumber cargoes at Rainier, Goble, Westport, Knappton, and some small mills. ..."
"... GOBLE, 40.6 m. (25 alt., 91 pop. ), is at the former landing of the Northern Pacific Railway Ferry at Kalama, Washington, before the building of the railroad bridge between Vancouver and Portland. ..."
Click image to enlarge Goble, Oregon. 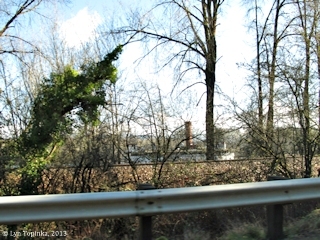 View from car while driving Oregon Highway 30. Image taken February 17, 2007. Click image to enlarge Goble Landing, Goble, Oregon. Image taken September 9, 2016. 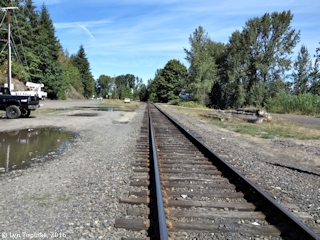 Click image to enlarge Tracks at Goble Landing, Goble, Oregon. View looking northwest. Image taken September 9, 2016. 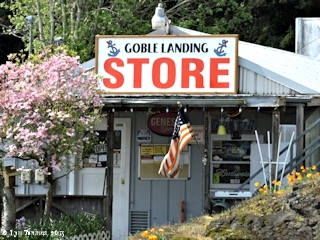 Click image to enlarge Goble Landing Store, Goble, Oregon. Image taken September 9, 2016. 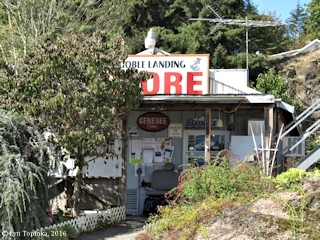 Click image to enlarge Goble Landing Store, Goble, Oregon. Image taken April 19, 2015. 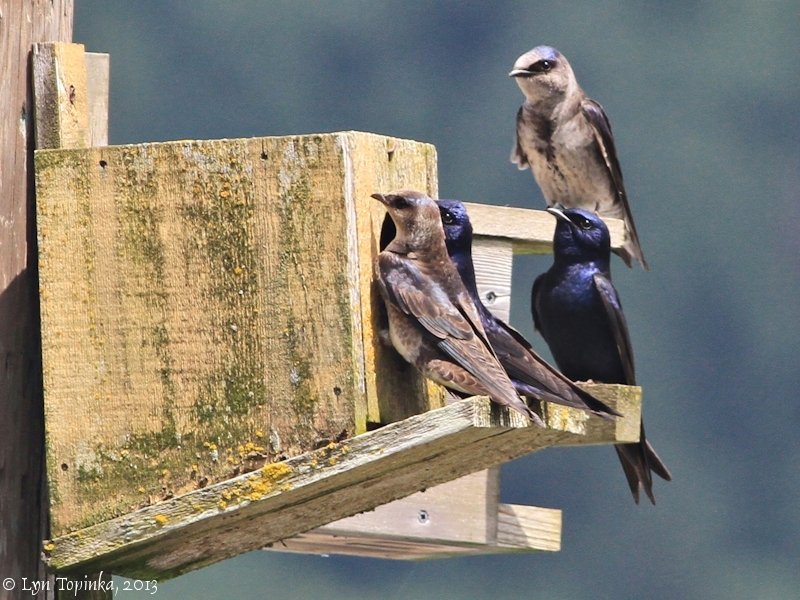 Click image to enlarge Purple Martins, Goble Landing, Oregon. Image taken May 31, 2013. 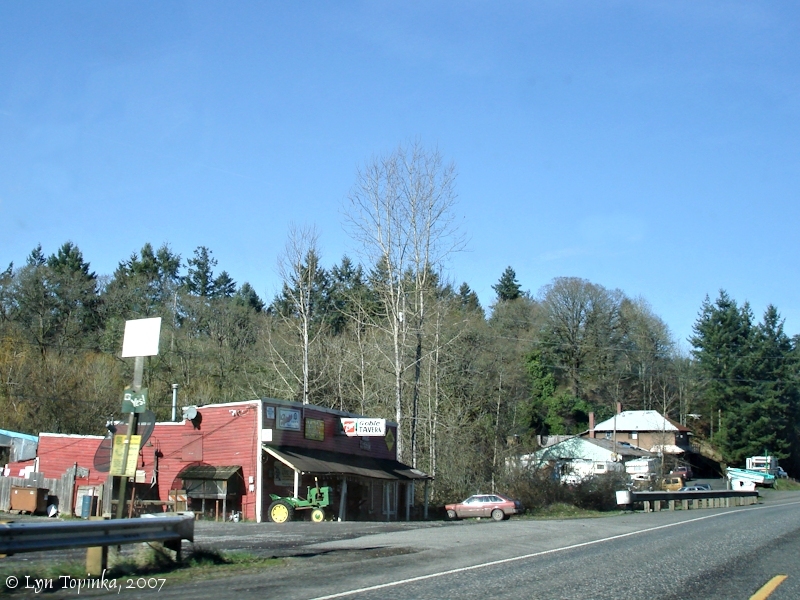 According to McArthur and McArthur in "Oregon Geographic Names" (2003, Oregon Historical Society), the Hunters Post Office was established in 1888 and served a settlement a mile or so south of Goble. Hunters was named for the Hunter family, local residents. The Hunters Post Office was closed in 1893 defering to the Reuben Post Office. Today the name has survived in Hunter Bar, the southern projection of Sandy Island. The U.S. Board of Geographic Names made "Hunter Bar" (over Hunters Bar) official in 1915. The now-forgotten community of Reuben (once known as Enterprise) was located about a mile south of Goble and was named for Reuben R. Foster, the second postmaster. The Reuben Post Office was established in 1890 and ran with one interruption until it was discontinued and defered to Goble in 1923. The 1881 U.S. Coast and Geodetic Survey map "Columbia River, Sheet 5, Kalama to Fales Landing", shows the community of "Hunters" on the downstream side at the mouth of Tide Creek, and "Enterprise Landg" across from "Sandy I. ", in the approximate location of today's "Elder Rocks". The 1888 U.S. Coast and Geodetic Survey map "Columbia River, Sheet 4, Grim's Island to Kalama", shows a "Ferry" on the downstream side of Tide Creek and a "Ferry" also depicted at the northern end of the community of Kalama. "Enterprise Landg" is also shown on the Oregon side, across from Sandy Island, as is "Gobles Pt." 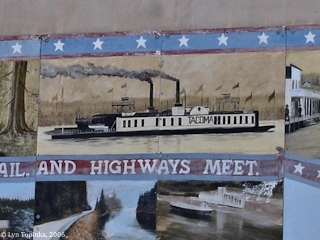 shown across from the downstream tip of Sandy Island. The 1888 map "Columbia River Sheet 5" shows "Enterprise Landg." 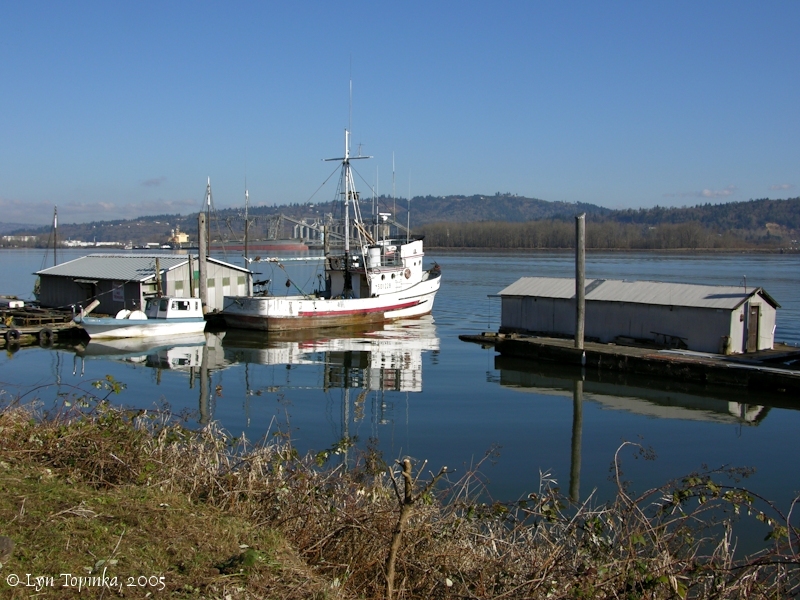 and "Hunters", plus the Ferry landing at Kalama. According to the 1895 "Lights and Fog Signals of the United States" (1895, Government Printing Office) the Hunters Post Light is a fixed white light located on the east side of a railroad wharf at Hunters, Oregon. The light is suspended from an arm on a natural colored pile. It was established in 1891. 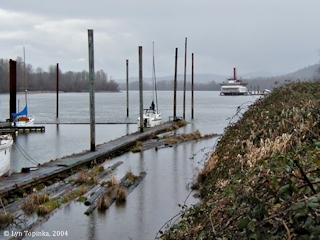 Click image to enlarge "River Queen" (through trees), now docked upstream of Goble, Oregon. 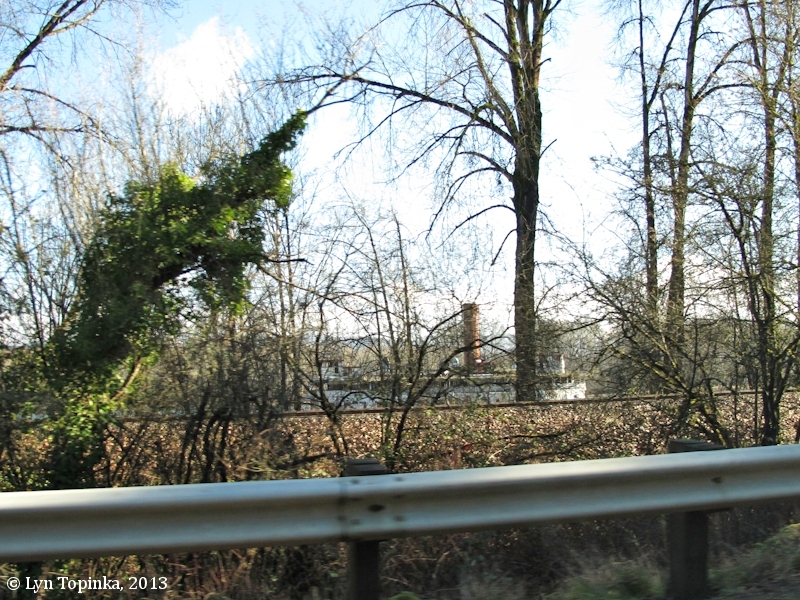 Image taken January 11, 2013. Click image to enlarge "River Queen" as seen from Goble, Oregon. Image taken February 28, 2004. Click image to enlarge "River Queen" as seen from Goble, Oregon. Image taken September 9, 2016. The early 1900s was the "Golden Age of Postcards", with the "Penny Postcard" being a popular way to send greetings to family and friends. The postcards now have become a image of history.